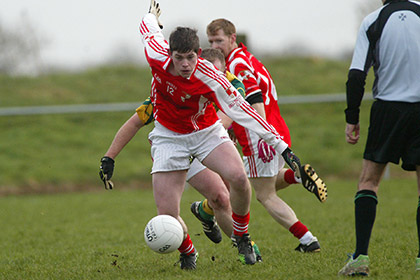 Both teams were short a number of regulars as Ballinlough took both points after a tough battle in difficult conditions in Nobber on Saturday evening. As teams all around the county will testify early league points are of most importance, come mid-summer they can be the difference between striving for promotion and battling it out at the wrong end of the table. ​Both teams got the same amount of scores but two majors from Ballinlough made the difference, indeed they could have made things more comfortable for themselves if they had not coughed-up a couple of gilt edged goal opportunities in the first half. Ballinlough's Tommy Mc Cullen got the first score of the game with a good point from 30 meters and after an even first quarter the sides were level; 0-2 to 0-2, before Ballinlough were awarded a penalty after 19 minutes. Peadar Byrne blazed over from the spot kick to give his team a one point lead, Nobber felt a sigh of relief but it was short lived as 'The Reds' put together a brilliant passage of play which led to their opening goal. Benji Smith took a sideline deep in his own half which found Mark Mc Cullen in space, he delivered a pin-point foot pass to birthday boy Jonnie Reilly who released Peadar Byrne, the ball was moved to Tommy Mc Cullen in a goal scoring position but the big full-forward unselfishly laid the ball off to Kevin Devine who palmed the ball into the net. Ballinlough led 1-3 to 0-3 at the break after playing against the elements in the opening half. Niall Farrelly got the opening score of the second half for Ballinlough but they took their foot off the pedal, Alan Farrell and Jamie Owens were active as Nobber kicked three points in a row to come right back into contention, 0-6 to 1-4. But then came the games decisive score in the 46th minute as Niall Farrelly did very well to divert a breaking ball into the Nobber net, it gave Ballinlough a clear advantage; 2-4 to 0-6. Both teams battled away gamely in the final quarter as Nobber tried to come back into contention but Ballinlough showed good experience and closed out the game well as midfielders Michael Geraghty and Derek Muldoon dropped deep to thwart any potential danger. Best for Ballinlough were Benji Smith, Emmet Smith, Michael Geraghty, Mark Mc Cullen and Niall Farrelly. Ballinlough - Keith McGuinness; Benji Smith, Pauric Muldoon, Robbie Farrell, Emmet Smith, Lorcan Maguire, Johnny Reilly, Michael Geraghty (0-3), Derek Muldoon, Kevin Devine (1-0), James Baugh, Mark Mc Cullen, Peadar Byrne (0-1 pen), Tommy Mc Cullen (0-1) and Niall Farrelly (1-1). Subs - Simon Deevey for Devine and Jonathon Mongomery Francis for Mark Mc Cullen.